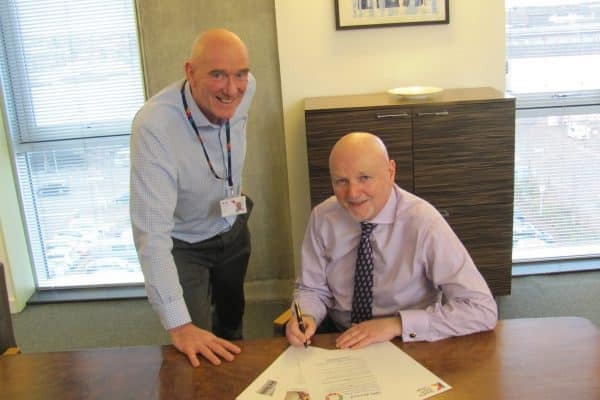 Earlier this week, Glasgow Kelvin College signed up to the UN SDG (Sustainable Development Goals) Accord as an expressed commitment to sustainable operations and the promotion of its Climate Change Action Plan. Through EAUC, the College is committed to the 17 goals as set out in the Accord. As a prelude to the opening of the GK Velocity Cycle Hub at Springburn, the College is delighted to show its support of these international goals. Iain Gordon, Head of Estates, is pictured with Principal Alan Sherry.